We keep hearing welfarists say that most people who go vegan went vegetarian first, so we should promote going vegetarian. We keep hearing welfarists say that if we promote “happy” meat and other “happy” animal products, that will lead people to go vegan eventually. This is all nonsense. There is no empirical evidence that establishes a causal link between any non-vegan situation and veganism. To the extent that people go vegetarian before they go vegan, or eat “happy” meat or eggs or whatever before they go vegan, is it any surprise? Animal organizations all promote vegetarianism and “happy” exploitation. Not one promotes veganism as an unequivocal moral baseline. It is our responsibility to make clear that if animals matter morally, we are obligated to go vegan. If someone cares about animals but wants to do less, that should be their choice and never what we promote. 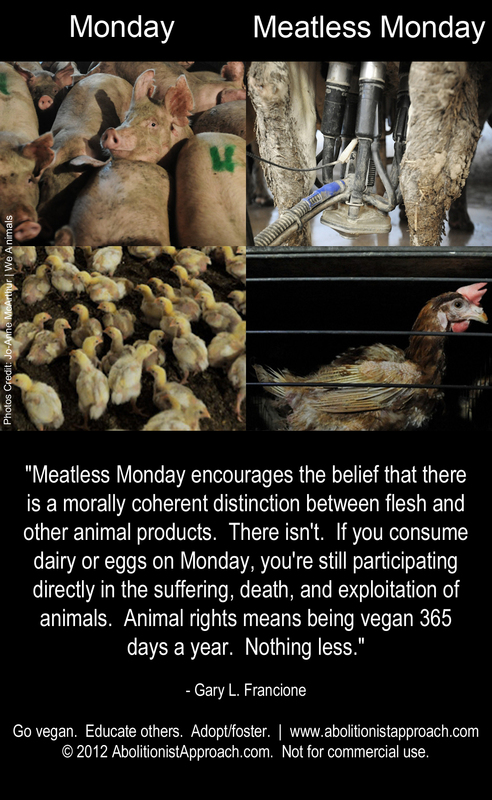 Telling people that vegetarianism, “happy” meat, “Meatless Monday,” “vegan before 6,” or “flexible veganism” are morally acceptable will just delay progress, and not lead to it.